The Kolpak QS7-066-CT indoor walk-in cooler boasts a rugged, high performance design intended for years of trouble-free use. A top-mounted, 1/2 hp refrigeration system fits flush to the interior cavity, giving you 100% usable interior space. Its self-contained design with automatic condensate evaporator doesn't require any plumbing, and it installs easily without the need for a refrigeration technician. The walk-in's "Posi-Loc" panel fasteners and magnetic gaskets ensure an airtight enclosure for high performance and energy efficiency, and an interior safety release prevents accidental entrapment. 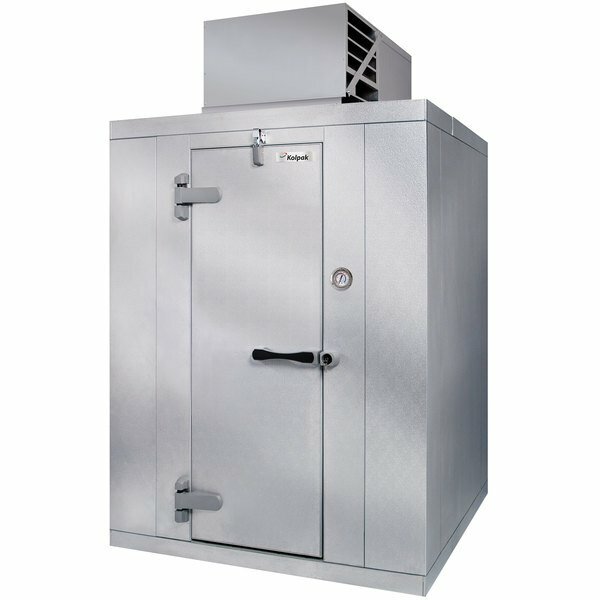 This walk-in features a 1/8" smooth aluminum floor that helps insulate the cooler and protect it from condensation forming. This is very important if you do not have a concrete floor at ground level on which to place your cooler. - Floor panels can withstand evenly distributed load of 700 lb./sq. ft. Height (Without refrigeration unit): 7' 6 1/4"
Height (With refrigeration unit): 9' 1 1/8"
This Indoor Walk-In Cooler works wonderful. Keeps our items cool, and in our small space works perfectly. Very spacious; and works great. We love it.